Andrew Cuomo's complaint filed in the New York Supreme Court, County of New York against the Bank of America and two former top executives has the potential to push that too big to fail entity off the edge of a very steep cliff. The charges of massive fraud are based on a compelling and exhaustive filing on February 4. The complaint charges fraud before, during and after the bank's merger with struggling brokerage firm Merrill Lynch in late 2008. The fraud cost bank shareholders and citizens billions of dollars. This is the first major case brought against our nation's largest financial institutions. These are the same financial institutions and executives that nearly destroyed the economy. Cuomo's press release states clearly that Lewis and the bank are examples of a much larger problem. It appears to be a leading indicator of future actions by the New York attorney general. Why else would Cuomo have generalized about institutions (plural) in his statement about this particular case? If Cuomo succeeds in taking down one of the toughest guys on the block, he'll make a point to the rest of the crew: you're next, get ready to cooperate. Many of the key perpetrators are located in Cuomo's jurisdiction, although Bank of America (BofA) is headquartered in Charlotte, North Carolina. Clearly, there are others in line for some New York style law and order. Cuomo is joined in this action by Niel Barofsky, Special Inspector General for the federal government's Troubled Asset Relief Program (TARP). TARP provides the billions in bailouts to bogus bankers and corporations. 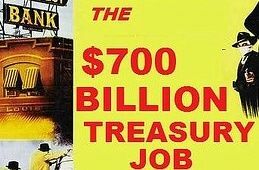 There's a credit line of $23.7 trillion should it be needed for even more bailouts. Ever wonder why you can't get a loan? They've taken all the money. The complaint also charges that the same parties with strong arming the federal government for $20 billion to cover Merrill's debt by threatening to back out of the merger if the money wasn't forthcoming. Then Secretary of the Treasury Henry Paulson and Fed Chairman Ben Bernanke had encouraged BofA to acquire Merrill, apparently without a rider that BofA would get billions in the process to cover their fraudulent business practices. The lawsuit seeks two overriding remedies. 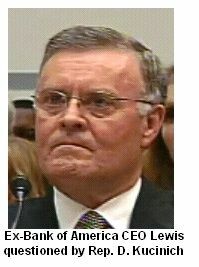 The two named defendants and the entire Bank of America are enjoined from "any conduct, conspiracy, contract, or agreement, and from adopting or following any practice, plan, program, scheme, artifice or device similar to, or having a purpose and effect similar to, the conduct complained of above." In addition, the defendants and the bank are to "disgorge all gains, pay all penalties and pay all restitution and damages caused, directly or indirectly, by the fraudulent and deceptive acts complained of herein"
These and the other remedies promise a degree of justice and, quite frankly retribution for the mess caused by the defendants. An unnamed and unintended remedy could be serious damage to the good will value of the Bank of America. The spectacle of a conviction of the bank and a former CEO and current division head for fraud would have a devastating effect on public confidence. Too big to fail may be a notion upended once and for all by a guilty verdict. Andrew Caffrey and Todd Wallach of the Boston Globe, hinted that Bank of America president and CEO, Brian T. Moynihan will be a key witness for the prosecution. The Globe article notes that the current BofA chief, "who was involved in negotiations (for the Merrill acquisition) as the bank’s general counsel, was not charged." Later in the same article, they quote Cuomo as saying, Moynihan, "has been candid with our office with respect to the roles he played after becoming general counsel." Put simply, Moynihan was central to the merger, knew about the fraud, participated in it, but didn't blow the whistle. All of that is established in Cuomo's complaint. He cooperated with Cuomo and wasn't indicted. His name will be at the top of the attorney general's witness list, no doubt. As if that's not bad enough for the bank, defendant Joseph L. Price, former CFO, is currently heading up Bank of America's credit card division. 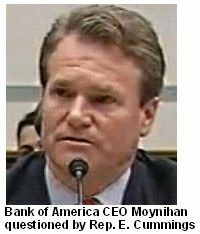 Should Moynihan testify, we'll see BofA's current CEO helping Cuomo convict his predecessor of fraud. Moynihan's testimony will also argue for a conviction of his current head of credit card operations. Since Bank of America is charged, we'll also see its current CEO plus the “Relevant Parties” described in the complaint testifying that the corporation was also guilty of fraud. Many of the 35 Relevant Parties named are current or former BofA executives or board members. Other key witnesses may include Federal Reserve Chairman Ben Barnanke and former Treasury Secretary and TARP architect Henry Paulson, They encouraged the Bank of America - Merrill Lynch merger as part of their efforts to prevent an alleged financial meltdown at the end of the Bush administration..
Charlie Gasparino of the Daily Beast reports that the defense counsel, former U.S. Attorney Mary Jo White, wants the case dismissed. If not, Gasparino says that "one person close to the defense” claims that White will call Paulson and Bernanke to testify. Cuomo has the facts and obviously believes Paulson and Bernanke on the sequence of events leading to these charges. Absent a “Perry Mason” moment by the defense, their testimony holds no surprises or benefits for the defendants. Mary Jo White has little or nothing at this point other than bluster. It's been ten years since Congress and President Clinton freed Wall Street and the major banks to open a big casino on Wall Street. That resulted in ruinous schemes like the real estate bubble. It's been five years since Alan Greenspan told citizens to get an adjustable rate mortgage, cash out the equity in their homes, and jump into the stock market. It's been over a year since Wall Street and the big banks nearly ruined the economy, cost citizens jobs, savings, retirements, and countless other hard earned gains through a variety of no-win schemes sold as solid investments. Nothing of any importance has been done to regulate the financial industry since the bailouts. Prior to the Cuomo-Barofsky charges, there have been no major cases brought against the perpetrators of our current troubles. Hopefully, New York Attorney General Andrew Cuomo started what will become an era of accountability for those at the very top. This should be about more than just one case. It's an example of top down accountability. May the bank, Mr. Lewis, and Mr. Price have the speediest of trials and the absolute maximum penalties should they be found guilty. They knew exactly what they were doing every step of the way. This article may be reproduced in full or part with attribution of authorship and a link to this article. It seems like in every glorified steal from the poor and give the rich financial scandal all that happens is a few scapegoats get nailed and nothing systematic changes. In other words, Ken Lay, Ebbers, yet during the dot con era it was an insider's game and companies like Citigroup really got a slap on the wrist. In SIGTARP's latest report (this goes to an overview with report attached), it makes a point to say they having ongoing investigations and hints about AIG abound for criminal actions. But what we need and clearly are not going to get is financial reform, esp. derivatives regulation. Glad to see you here Michael, this is an excellent post. This case is very interesting. What Cuomo can't do, Barofsky can. Whatever information each of them needs, the other has or can get. That's a powerful alliance, a foreboding one for the perpetrators of fraud etc. I thought a good deal about this very interesting article on Geithner's exposure to prosecution. It makes good points. But there's always the federal code that say you can be prosecuted for not going your job (defrauding the government of salary) used against Nixon. If any government official was working for the crooks instead of the people, he/she can be charged. This may amount to very little or Cuomo and Barofsky may pull off one of the biggest cases of all time. I share your discouragement on real regulation on derivatives and that fantasy sized market. One would assume that with the biggest losses in history due to regulatory changes, they'd fix the problem. But that's not their job. The only hope there is some outside force really ramming into Congress and forcing re-regulation. Both national parties are brain dead with one a side show and the other.asleep at the switch. it will take an outsider and outside events to capture the people and a real reform movement. had on Fire Dog Lake (and frankly I think some of the positions they advocate are economic insanity) and a real Tea party rep. (versus the attempts by the corporate GOP to hijack these people) and was talking about getting consensus on some policy points. I normally think of Tea Party as insanity too but when this one came on his show, I realized it was FAUX news spinning them to what many are about on that score. A huge point of agreement was corporate governance, corruption and this bail out. Another good point was to demand politicians vote and do what there constituents want, period, instead of voters having to choose between the least of two evils. This is one of the purposes of this site, to look at things from the facts, from the theory, mathematics, stats of it all and consider policy accordingly. I mean there is so much spin on anything and TV, every day they take the frivolous comment, it's seemingly a diversionary tactic, and pound it into the ground. So, that is the question, can the real people with common sense find agreement on what they want and demand those policies? On Geithner, I really suspected that was implied frankly but I wasn't going to write it until some hard evidence appears, I'll let others speculate on that one! One thing about those SIGTARP reports, you see the situation in one document, one "big picture" and well, it's all hinging to me on bubble reinflation, just complete denial Americans are tapped out. I agree with the fundamental point you mentioned - vote in the interests of those who elected you and all others that you represent. It is a measure of our problems that we have to make this point but it's necessary. The first bailout produced more calls, emails and faxes than any bill in memory. Anti bailout sentiment ran 30 to 1 in some cases but was overwhelmingly negative on the bill across the board. What did that get the voters - a 238 to 205 (approx) defeat of the bill. Days later, it was approved after both presidential candidates showed up and supported it. Public sentiment had not changed and, as for as the candidates, they were the only choices. What does it take to get Congress to respond to the people. They knew this protest was spontaneous, yet they ignored it, even though it was overwhelming. That's a huge problem. The Fire Dog Lake - Tea Bagger dialog is interesting. I can't imagine their economic proposals. This level of contact is good, however, since it overcomes the cultural divide between liberals and those on the right who share views. Divide and conquer is the means of maitaining the status quo. There was a chance for this type of unity after Obama got elected had he honored the "constitutionalist" constituency which is the right and left. He didn't and that chance was lost.